In 2015, NASA's Hubble Space Telescope precisely measured the mass of the oldest known planet in our Milky Way galaxy. At an estimated age of 13 billion years, the planet is more than twice as old as Earth's 4.5 billion years. It's about as old as a planet can be. It formed around a young, sun-like star barely 1 billion years after our universe's birth in the Big Bang. The ancient planet has had a remarkable history because it resides in an unlikely, rough neighborhood. A few intrepid astronomers have concluded that the most productive to look for planets that can support life is around dim, dying stars white dwarfs. "In the quest for extraterrestrial biological signatures, the first stars we study should be white dwarfs," said Avi Loeb, theorist at the Harvard-Smithsonian Center for Astrophysics (CfA) and director of the Institute for Theory and Computation. Even dying stars could host planets with life – and if such life exists, we might be able to detect it within the next decade. The ancient planet orbits a peculiar pair of burned-out stars in the crowded core of a cluster of more than 100,000 stars. The new Hubble findings close a decade of speculation and debate about the identity of this ancient world. Until Hubble's measurement, astronomers had debated the identity of this object. Was it a planet or a brown dwarf? Hubble's analysis shows that the object is 2.5 times the mass of Jupiter, confirming that it is a planet. Its very existence provides tantalizing evidence that the first planets formed rapidly, within a billion years of the Big Bang, leading astronomers to conclude that planets may be very abundant in our galaxy. In an earlier discovery, in July 2003, Hubble helped make the astounding discovery of a planet called PSR B1620-26b, 2.5 times the mass of Jupiter, which is located in globular cluster M4 shown in the image below taken by Hubble Space Telescope. It contains several tens of thousands stars and is noteworthy in being home to many white dwarfs—the cores of ancient, dying stars whose outer layers have drifted away into space. It is the first planet found in a globular cluster, and one of the oldest known extrasolar planets, believed to be about 12.7 billion years old. PSR B1620-26 b orbits a pair of stars just outside the core of M4: a pulsar, a neutron star, and a white dwarf with a mass of 0.34 solar masses orbiting each other at a distance of 1 AU about once every six months. Each orbit of the planet (artist impression below) takes about 100 years. Because all stars in a cluster form at about the same time, and planets form together with their host stars, it is likely that PSR B1620-26 b is also about 12.7 billion years old, nearly three times as old as Earth. 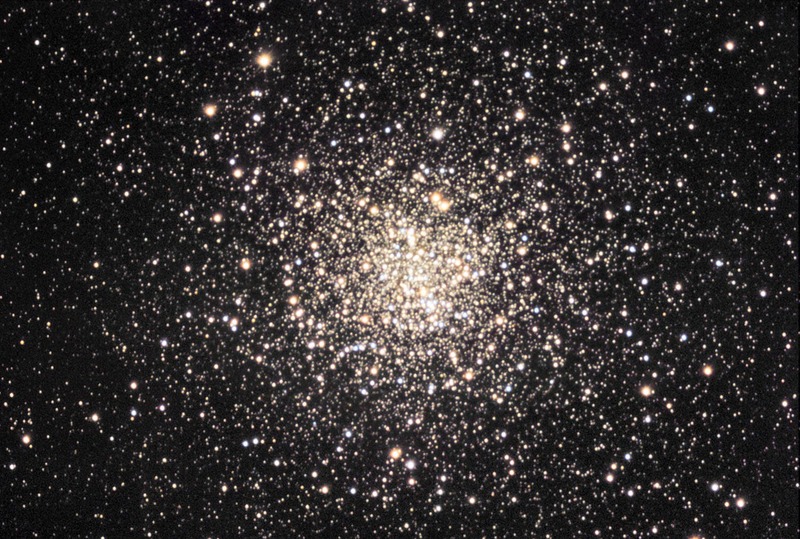 There are about 150 known globular clusters in the Milky Way. It is thought that globular clusters formed very early in the vast halo surrounding the nascent galaxy before it flattened to form the spiral disc. "A globular cluster might be the first place in which intelligent life is identified in our galaxy," observed Rosanne DiStefano of the Harvard-Smithsonian Center for Astrophysics (CfA) in January, 2016. Globular star clusters are extraordinary in almost every way. The globulars, which are found in the halo of a galaxy, contain considerably more stars than the less dense galactic, or open clusters, which are found in the disk. They're densely packed, holding a million stars in a ball only about 100 light-years across on average. They're old, dating back almost to the birth of the Milky Way. 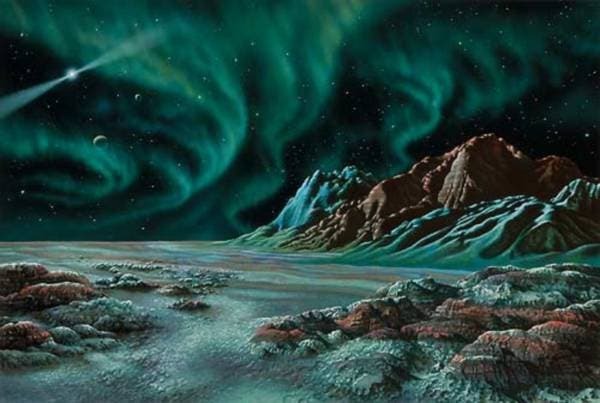 And according to new research, they also could be extraordinarily good places to look for space-faring civilizations. A habitable planet would circle the white dwarf once every 10 hours at a distance of about a million miles. * Before a star becomes a white dwarf it swells into a red giant, engulfing and destroying any nearby planets. 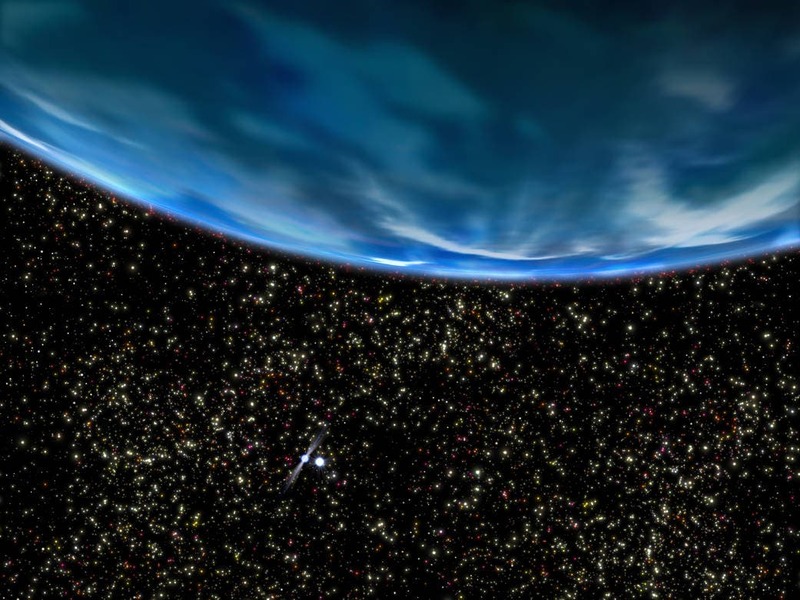 Therefore, a planet would have to arrive in the habitable zone after the star evolved into a white dwarf. A planet could form from leftover dust and gas (making it a second-generation world), or migrate inward from a larger distance. "JWST offers the best hope of finding an inhabited planet in the near future," said Maoz. Recent research by CfA astronomers Courtney Dressing and David Charbonneau showed that the closest habitable planet is likely to orbit a red dwarf star (a cool, low-mass star undergoing nuclear fusion). Since a red dwarf, although smaller and fainter than the Sun, is much larger and brighter than a white dwarf, its glare would overwhelm the faint signal from an orbiting planet's atmosphere. JWST would have to observe hundreds of hours of transits to have any hope of analyzing the atmosphere's composition.